Minutes after Vitor Belfort (pictured) posterized Luke Rockhold with a vicious spinning heel kick to the grill on Saturday night, two of the top five things trending on Twitter in America were #Belfort and #TRT. Despite posting his second consecutive highlight reel finish, becoming the only man in UFC history to eliminate consecutive opponents in head kick fashion (Michael Bisping was his prior victim), the only thing most people wanted to talk about was Belfort’s use of testosterone replacement therapy (TRT). “The Phenom,” on the other hand, had no interest in speaking about his use of the controversial treatment. “Can somebody beat him up for me, please?” Belfort pleaded at the post-fight press conference when asked to address his TRT use. “Can somebody beat him up? MMAJunkie is an American MMA news outlet, so perhaps Belfort would feel more comfortable if one of his Brazilian brethren inquired about his use of the medically prescribed drug in Portuguese. 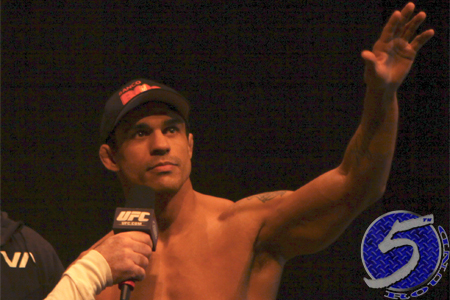 While the 36-year-old Belfort refuses to discuss TRT, the heated debate rages on around him. Just don’t dare to ask Belfort for his take on it.